This week Indonesian President Joko Widodo (Jokowi) was met with Free West Papua protests on his tour of European Union countries. 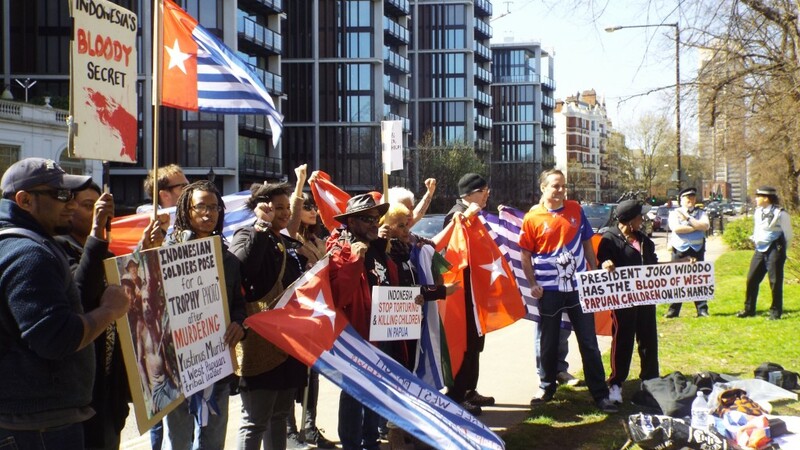 Earlier this week, the Free West Papua Campaign announced that we would demonstrate against the arrival of President Jokowi because he is guilty of orchestrating the continued genocide and illegal occupation of West Papua. Yesterday in the United Kingdom, we held a demonstration outside the Mandarin Oriental Hotel where President Jokowi was joining a business meeting. There was a good turnout from the demonstration and we were joined by veteran human rights campaigner Peter Tatchell who famously tried to arrest former Indonesian President Susilo Bambang Yudhoyono during his state visit to the UK in 2012. Yesterday Peter Tatchell along with Free West Papua activists confronted the Indonesian President arriving at the hotel and made sure that he was well aware that he was not welcome while he continued to orchestrate the genocide and illegal occupation of West Papua. At the end of the business meeting President Jokowi left flocked by Indonesian intelligence but he along with the other Indonesian delegates were visibly very frustrated and shocked to see so many West Papuan flags, (which are banned in Indonesia) so close to them. We would like to thank everyone who attended this very successful demonstration which gave the Indonesian President a very strong message that he will never be welcomed and that wherever he goes, people will continue to demand that West Papua be free. 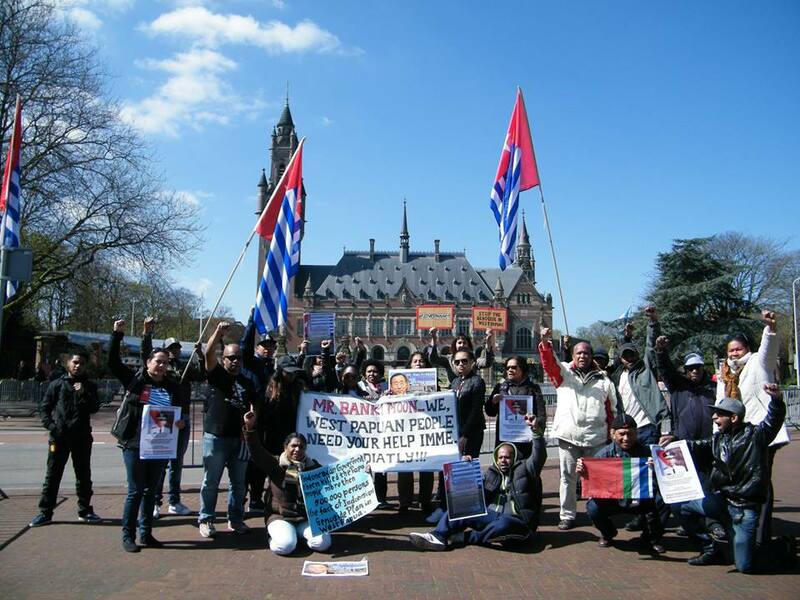 As well as in London, The Free West Papua Campaign (Netherlands) held a demonstration outside the International Criminal Court in The Hague. The Secretary General of the United Nations, Mr. Ban Ki Moon and the Dutch Foreign Minister Hon. were both present at the court at the time and both saw the demonstration which involved many exiled West Papuans raising their national flag and calling for justice. Indonesian President Jokowi also visited the Netherlands and according to reports, the Dutch Parliamentary Foreign Affairs Committee requested to meet with him to discuss the human rights situation in West Papua however President Jokowi refused. Several Dutch MPs also met with West Papuan leaders and showed their support for an Internationally Supervised Vote (Independence Referendum) for West Papuan self-determination. 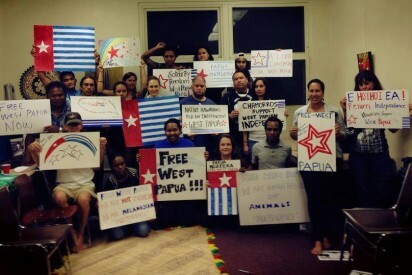 They can be seen in these photos holding the #LetWestPapuaVote cards. Raki Ap, from the Free West Papua Campaign Netherlands was also interviewed by Dutch National News about the Indonesian President’s upcoming visit and he described how the Dutch government has an obligation to support self-determination for the people of West Papua as this was their former colony. Again we would like to thank everyone in the Netherlands, including MPs, Joël Voordewind (ChristenUnion MP) Harry van Bommel (Socialist Party MP) Cees van der Staaij (Reformed Political Party MP. Indonesian President Jokowi cannot hide from the truth anymore. People all around the world are finding out about the ongoing genocide and illegal occupation of West Papua. One day West Papua will be free!